Chinese civilization ranks among the most ancient and highly-developed in existence today. The quality of this civilization is perhaps most clearly evident in certain tangible cultural scenery of cultural signi-ficance, popular art, and folk customs and items related to them. All these things represent traces or remmants of the lives of the people; they embody popular sensibility and manifest the innate wisdom of the Chinese. By studying such remnants it is possible to achieve a more concrete under-standing, not merely of how the Chinese lived in the past, but of an abiding ethos and spiritual strength that continues to thrive today. One of the most important tasks in the work of encouraging cultural development is the preservation and maintenance of our cultural heritage. Although the Chinese people have encountered numerous obstacles and hardships over the centuries, still they have been able to create and main-tain a cultural order shaped by resolute determination and the will to overcome adversity. It is this unique achievement-what the Chinese call"the legacy of the sages of the past"-that specially deserves to be handed down to future generations. Itis only in recent years that , due to increasing influence from the West, traditional culture has declined to so lamentable a degree. The government has been aware of this predicament for some time; its growing concern has now resulted in the Program for the Preservation of Cultural Assets which will work to maintain our heritage for the enrichment of the public and the future glory of Chinese civilization. "Historical sites' as a category encompasses a very broad range; it includes sections of old city walls, fort battlements, administrative offices, study halls, mansions with gardens, family shrines and temples, tablets and stelae, memorial arches, gravesites, and other architectural sites. All these things preserve that spirit of fortitude and endurance with which the pioneers who came to Taiwan developed and cultivated this land. Thus, it is only logical that concern for our national heritage should begin with the preservation of these historical sites. Unfortunately, in recent years many of these sites have suffered serious deterioration owing to remissness or negligence. Therefore, the Executive Yuan has requested the Council for Cultural Affairs to take charge of the maintenance and future conservation of these sites. In addition, the Council was entrusted with the work of cataloguing all known sites and appraising their historical and artistic value. Accordingly, in January 1983 the Council organized an ad hoc team of scholars and experts to investigate these sites. In the ensuing inves-tigations, a list of 460 sites was presented to the Ministry of the Interior for potential admission to the status of Historical Sites of the First Rank. 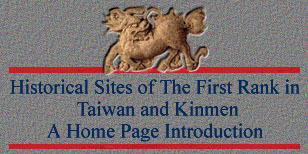 After a twenty-seven phase sequence of investigations carried out over a period of more than three years, as well as research and several meetings for discussion, the sites presented in this book ware declared official Historical Sites of the First Rank in reports submitted to the Ministry of the Interior on December 28, 1983 and August 19, 1985. Those who worked on the team brought to their task rigorous objectivity, a painstaking attention to detail, and an unflagging zeal for their work. These eighteen historical sites have been selected for their unique historical, cultural, and artistic value, for which qualities they surely deserve the most careful maintenance and attention. As a means of bringing the value of these sites to the notice of the general public, the Council has produced a series of fourteen short three-minute films, broadcast in sequence over each of Taiwan's three television networks, highlighting noteworthy features of the province's historical sites. An attractive series of some twenty pamphlets introducing related aspects of Taiwan's cultural heritage has met with an enthusiastic res-ponse. Now this volume of photographs is presented to the public in the hope of conveying a broad understanding of the historical significance represented by these ancient sites to a general audience.